The 2011 playoffs have been off the hook. In the very first game the Bulls showed us why TNT knows drama when Michael Jor—I mean, Derrick Rose looked as if he would put up a contested layup before dishing it off to John Pax—I mean, Kyle Korver for a game winning three-pointer. Okay, so maybe Game 1 of the 2011 Eastern Conference Quarterfinals is not really comparable to Game 6 of the 1993 NBA Finals, but as a Bulls fan, it was eerily familiar. The best part for Bulls fans is that the city has a star basketball player that isn’t incessantly dubbed the next MJ. From Harold Miner to Kobe to Vince Carter to Lebron, there have been too many players living in his shadow already. To have been subjected to the comparison while playing on the same team as His Airness would have been like playing in a solar eclipse. More importantly, as an NBA fan, Derrick Rose is a spark of serious excitement. Besides being humble, he is that versatile, hybrid type of player we have seen marching into the league in succession since Kevin Garnett. As Lebron is part Magic Johnson, part Adrian Peterson, and part Pokemon, Derrick Rose is part Oscar Robertson, part Allen Iverson, and part Mighty Mouse. And best of all, he seems to be the antithesis of Lebron in at least one area. As much as I hate to admit it, Kobe has won the most like MJ, offensively speaking. 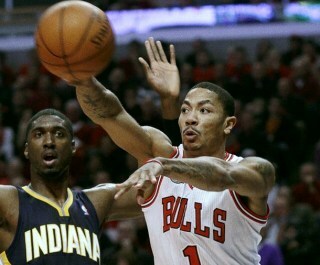 But D-Rose probably has MJ’s best quality, his will to win. It’s an intangible quality that so many talented players have simply lacked over the past decade. While sometimes injuries are to blame, too many other players with incredible talent have squandered it (e.g. Vince Carter). Sure the Bulls lost Game 4 to the Pacers, but their 13-point run in the last two minutes of the game was catalyzed by Rose’s steals. When Rose stepped onto the court with four fouls midway through the 3rd quarter in Game 5, he showed why he will be the MVP. Not shooting well from the field over the last three games, he iced the game by nailing three treys while blocking seven-footer, Roy Hibbert. If Derrick Rose decides he wants to win, his team probably does. Not very different from a certain player that made sure his team was victorious despite battling the flu. It’s just round 1 of Derrick Rose’s third season, and all this praise might be premature. But if watching him this season hasn’t excited you, go watch some shin kicking.